The warmer temperatures experienced in the tropics increase the intensity and onset of the same operational threats which occur in temperate impoundments, and the longer duration of high water temperatures extends the period in which they may be encountered. Tropical impoundments present additional difficulties of their own, however. They may suffer simultaneously the effects of organic pollution, eutrophication, and siltation. High phytoplankton production at tropical temperatures is often mainly by cyanobacteria, constituting heavy and persistent blooms. A tendency for continental waters to be deficient in nitrogen favors the heterocystous atmo spheric dinitrogen fixers. Among these, Cylindrospermopsis, a toxin producing, nitrogen fixing species, is expanding its range among eutrophic lakes and impoundments at tropi cal latitudes, where it contributes to poorer quality and increased treatment difficulties. Actual and threatened incidences of cyanobacterial toxins reaching drinking water supplies are also being documented. One of the phenomena which are confined largely to the tropics is the development of floating vegetation, from the Lemnaceae and ferns found in small, sheltered pockets, to the persistent, surface choking development of such free floating plant species as Eichhornia crassipes, Pistia stratiotes, or Salvinia auriculata which can plague large impoundments soon after their creation. Under these conditions, boat pas sage is difficult, fishing impossible and floating mats are piled by wind against piers and other structures. 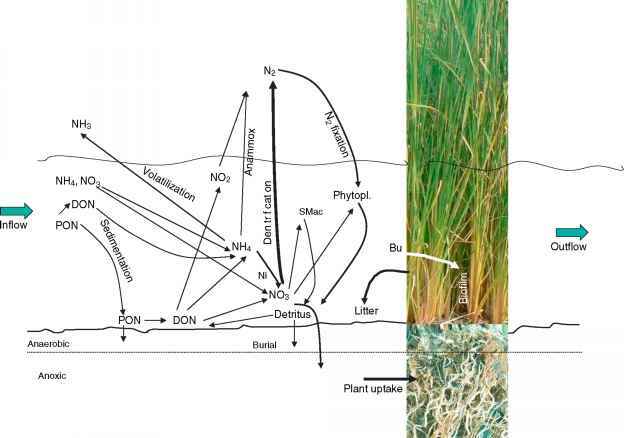 Floating macrophytes generate sedimentary organic detritus and potential oxygen deficits, while shading prevents the com pensatory generation of photosynthetic oxygen. Health issues implicating tropical impoundments include the spread of cholera, typhoid, and insect vectors for diseases such as malaria. In addition, the incidence of schistosomiasis has increased in the wake of flooding of new tropical impoundments.